Throughout his long career, Albert H. Wiggin of Peaceable Street did wonderful things for his company, the Chase National Bank in New York City. He helped make Chase one of the biggest and most influential banks in the country, if not the world, and aided European countries recovering from World War I. But his reputation was tarnished after the Crash of 1929, during which he pulled off maneuvers that made millions for himself in ways that wound up being investigated by the U.S. Senate. 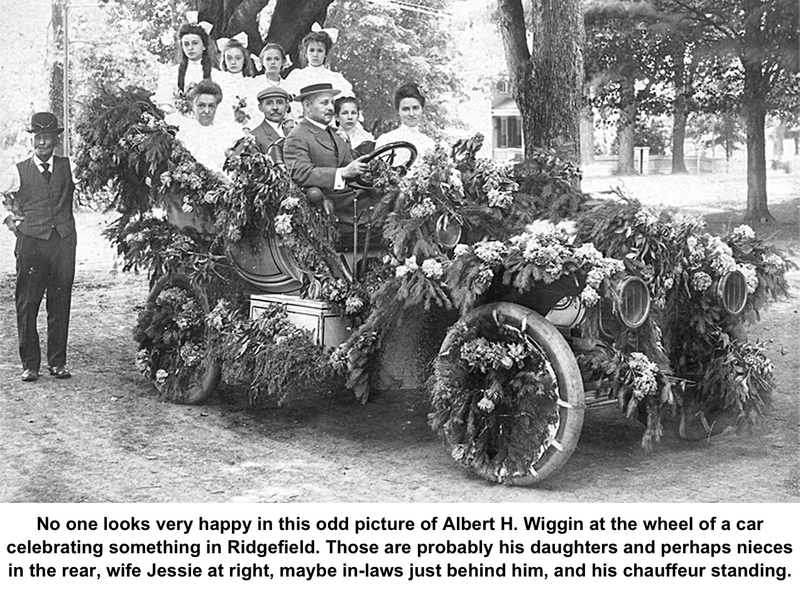 Once listed among America’s richest people, Albert Henry Wiggin was born a minister’s son in 1868 in Medford, Mass. He never attended college and instead went to work in Boston straight out of high school, soon becoming a bookkeeper for a local bank. By the age of 23, he was an assistant for a national bank examiner. 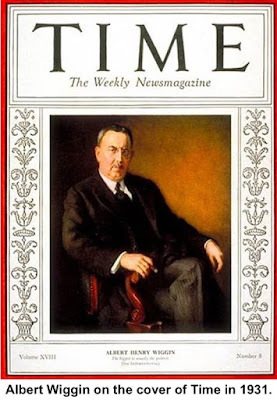 He continued to rise in the Boston banking world and in 1899, moved to New York where he became at the beginning of the 20th Century one of the founders of Bankers Trust (which, at the end of the century, was acquired by Deutsche Bank). youngest ever vice president of Chase National Bank. He also became the youngest member of the bank’s board of directors, a situation that irked many veteran Chase executives. Hepburn liked Wiggin so much, he encouraged him to establish a summer place in Ridgefield, and sold him some of the backland of his own estate on High Ridge, called Alnacraig. 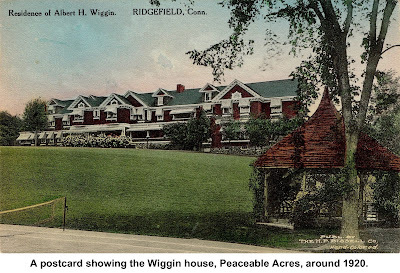 Wiggin built a many-roomed mansion at 47 Peaceable Street, calling it Peaceable Acres. The estate overlooked the Ridgefield Golf Club, later Ward Acres horse farm. Locally Wiggin was known for his beautiful daughters, Marjorie and Muriel, and for being among the first owners of an automobile. 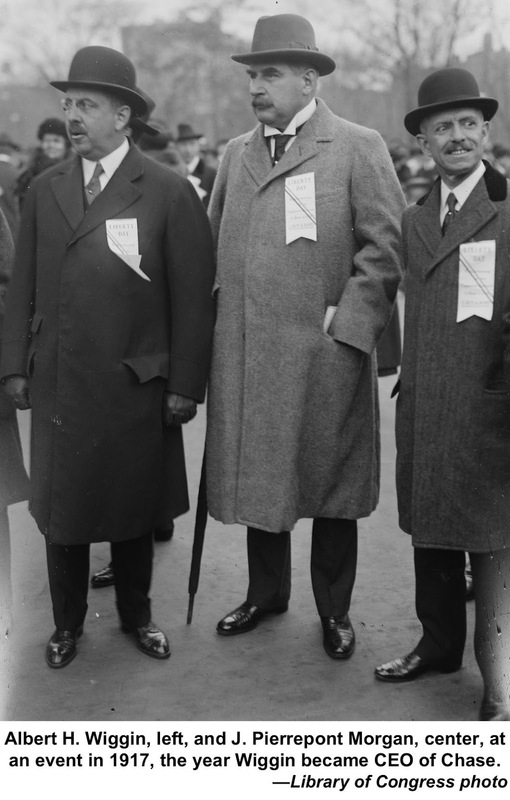 In 1911 Wiggin became Chase’s president. Under his leadership the bank’s deposits rose from $91 million in 1910 to more than $2 billion in 1930. 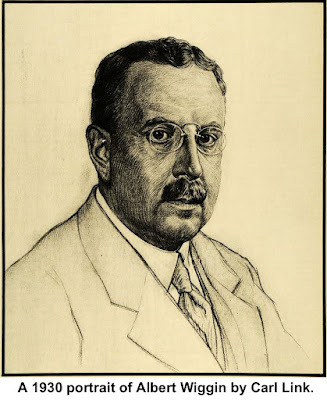 He was CEO from 1917 until 1930. 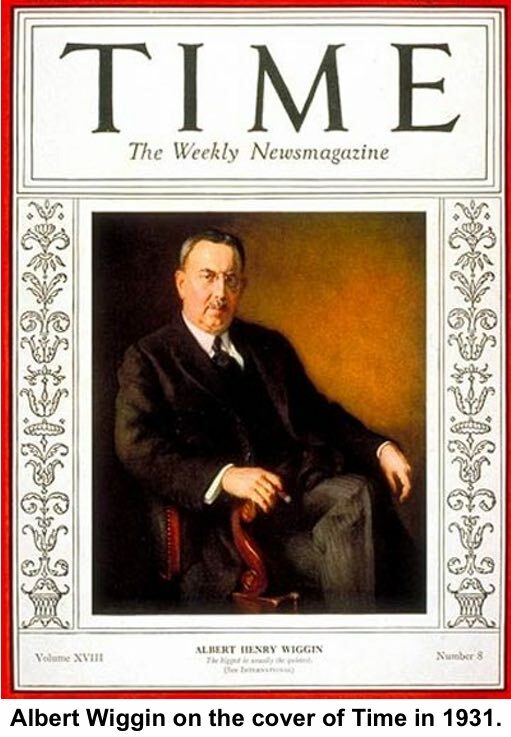 Time Magazine, which put him on the cover in 1931, called Chase “the biggest bank in the world” at that time. Despite this acclaim, some authorities were soon labeling Wiggin a scoundrel after it was revealed that, during the period of the 1929 stock market crash, he had been selling short some 42,000 of his personal shares in Chase National Bank at the same time he was committing Chase’s money to buying. He put his earnings in a Canadian holding company to avoid taxes, and made millions that the bank itself did not discover until a later U.S. Senate investigation. “This is like a boxer betting on his opponent — a serious conflict of interest,” said financial reporter Andrew Beattie. And yet, he did nothing illegal. Wiggin was forced to retire, but was never prosecuted for any legal wrongdoing. He was given a $100,000-a-year pension from the bank ($1.7 million in 2016 dollars), but later turned it down after a public outcry. As a result of the case, Congress added what some called the “Wiggin Provision” to federal Securities Exchange Act to prevent company directors from selling short on their own stocks and making a profit from their own company’s bad times. Wiggin had sold his Ridgefield home in 1921, long before the crash, and eventually had a retreat on the shore in Greenwich where he died in 1951 at the age of 83.
these works to the Boston Public Library, the New York Public Library and the Baltimore Museum of Art. He contributed to the MIT library, endowed a scholarship at Middlebury College, and created a foundation that contributed to many organizations.